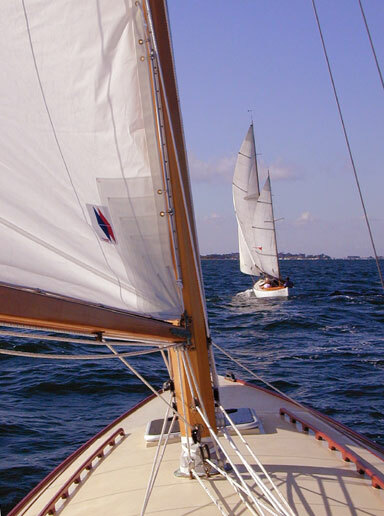 In 1950, Sidney Herreshoff, son of the famous Nathaniel, designed a boat that was built using what was then an innovative new material - plastic resin reinforced with glass fibers - Fiberglass. ARION, at 42' was to be the first large sailboat ever attempted in this material. Many were skeptical about the suitability of this material in large craft. In order to reduce the loads and strains that were to challenge this vessel, Mr. Herreshoff elected to minimize the hull resistance so that she could be driven with a small rig. It is my belief that he chose a ketch rig to facilitate easy sail combinations. A fin keel with the lead at the bottom, and a balanced rudder, complemented the canoe hull shape. I don't know why this boat did not become popular at the time for she developed a great reputation. The reasons may be found in the new-fangled hull material, or that the new hull/keel design combination was too much for conservative sailors of the time. So after some initial excitement she faded from view. Arion, S.Herreshoff 42' - Early sail. Several years later, L. Francis Herreshoff, the better known brother, designed the 28' canoe bodied ketch he called Rozinante. 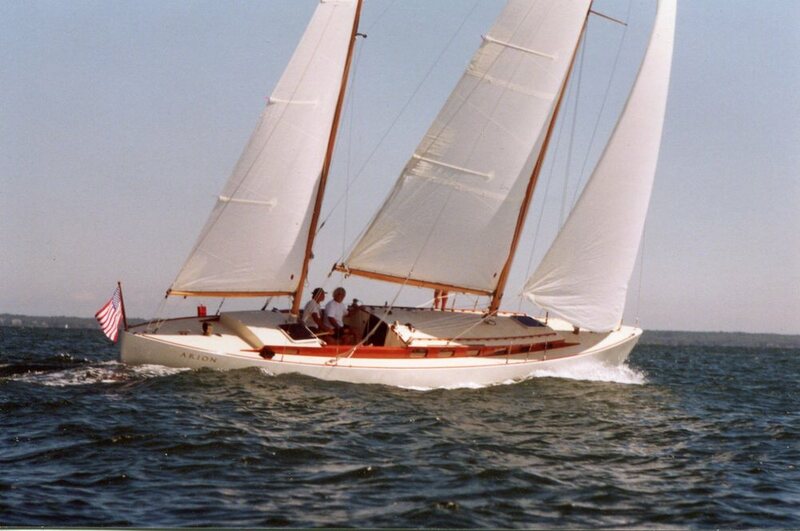 In my opinion, and almost all of those who have owned one, a Rozinante embodies all that is good about sailing. It is actually difficult to explain, but when you are sailing a Rozinante you are happy; you are not sure exactly why, but you know that you are happy. Other people watching you sail are also happy because they are watching one of the most beautiful and graceful vessels ever designed. This may sound like a page in a Madison Avenue brochure, but with this boat it is true; ask anyone who knows this boat and there will be no argument. The Rozinante, however, has one drawback - her size. She is so small that it is difficult for her to accommodate enough stuff to support an extended cruise for two; and the lack of a self-bailing cockpit can lead to some anxiety when venturing offshore. Having built and sailed the Rozinante, the desire to replicate her in a design capable of going offshore became my goal. In discussions on this topic with designers and customers alike, I found plenty of skeptics. I asked for long, lean, light and low. Beauty was another request, but that quality cannot be separated from the other aspects of the design and tacked on later - although judging from many modern designs I would guess it may often be the approach - it is fundamental to total design. Beauty exists embodied in the final statement of the whole design. It is achieved not as a separate activity, but flows from the integration and careful execution of all the other design aspects. As for a sampling of the skeptical remarks, one well known designer said "I 'm not sure it can be done"; another said "more weight for stability was necessary"; a third said "those features are what I would want in my boat, but you will have a hard time convincing customers that they can't have all of the amenities that they have been told that they need". Frustration from these remarks lead to the realization that I would have to design her myself and show the world. Sadly, starting from scratch I just couldn't afford this dream; but fate stepped in and saved the day. I had known of ARION's existence for 25 years and soon relocated her, her hull, apparently sound, resting comfortably on poppets out in a field. I bought the hull, keel, and some additional small bits and pieces - very little else had survived. Her reconstruction was fun, and proceeded with enthusiasm and a sense of expectation. The re-launching took place exactly 50 years from her first launching, on her 50th birthday. To me it was the resurrection of an antiquity, an archeological excavation, and the assembly of what I thought to be the perfect combination for sailing/cruising. I have been ecstatic over the discoveries of the attributes of this vessel learned while rebuilding her, getting her tuned, and just sailing her. She is very fast, with an easy motion; she sails herself with almost no input on the tiller, and she maneuvers inside the harbor like a 15' day sailor. The preceding paragraphs beg the question. If a boat designed 50 years ago can sail as described why hasn't it been copied? Is the average sailor really more interested in comfort below than good sailing attributes? An analysis of 10 popular designs produced in the seventies reveal almost identical proportions. IE: length/beam/displacement/sail area etc. Even the best of these designs would be a poor performer compared to ARION. I am truly mystified. What am I missing? Creature comforts are nice no question but in the spectrum of design compromise I much prefer a dry comfortable cockpit, ease of handling and a good ride. ARION is not a stripped out camper she has a galley with stove, sink and refrigerator. She has a small settee, an enclosed head, 2 single berths and two double berths in two separate cabins with 14 opening ports. Her design features may be a little extreme but she has proven to me that the design concept is not only valid but truly better. A recent trip to the Newport boat show confirms that the trend continues to produce wide heavy boats. The ergonomics of yacht design has centered on the vessel at rest and for many this is just fine. There are , I believe, many others to whom I would suggest that it is time to re-evaluate your choices and demand a better design blend.